Stories | Save the MFTD Waiver! If you meet Michelle, you will never forget her. This charming 15-year-old is just one of the 500 kids in the MFTD Waiver. Michelle is diagnosed with Hallerman-Streiff Syndrome, a craniofacial syndrome that causes her to be legally blind, hearing impaired, of short stature, and require a tracheostomy and ventilator to breathe. Michelle is also a pianist, dancer, and good student who is thinking of becoming a doctor or teacher. "What they don't understand is that my daughter is a thriving part of society," says Michelle's mother Mary. "So, what are we going to do? Put her in a little ambulance and just say, 'Bye, we loved you, but sorry we can't take care of you anymore'?" Without the waiver, Michelle could not live at home. "Even a nurse, or a doctor--any human being--can't take care of a vent patient alone 24/7," said her mom. One of Michelle's long-time nurses stated, "I don't know how a parent could physically do that. Even if they had superhuman qualities and didn't have to sleep at night, to maintain that level of care for 24 hours is just impossible." "If state legislators could meet Michelle and see how this Medicaid Home Care program has allowed this child to have a full life--thrive, go to school, get smart, enjoy life--I think they might change their tune quite a bit. 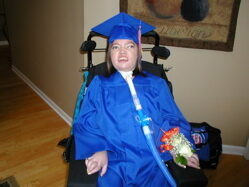 She is a success story of the waiver program," said Mary, Michelle's mom. LY is a four-year-old brilliant and amazing little girl with a sense of humor and a lust for knowledge! She is diagnosed with a rare muscle disorder called CFTD and is ventilator dependent, tube fed, and requires assistance for all activities of daily living. 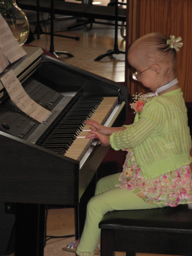 She is nonverbal but highly intelligent and has been able to read since she was 2.5 years old. She has a future that is unknown, yet VERY hopeful! We cannot predict the future for any child; however, if LY does not receive her frequent therapies or her 24/7 care and treatments, she will never reach her full potential. LY is such a beloved and important part of her family of four. Her parents cannot imagine not having her home with them. Without the waiver she could not live at home because her private insurance won't pay for her nursing. Her family is so thankful for her home nursing care through the waiver. KM is a second-grader who gets good grades, is on the honor roll, loves animals and loves to go to the zoo. She has a tracheostomy and uses a ventilator to breathe due to an extremely rare syndrome called Rapid-onset Obesity with Hypothalamic Dysfunction, Hypoventilation and Autonomic Dysregulation, more commonly known as ROHHAD. This syndrome causes major medical issues in many parts of her system. She has balance complications, temperature regulation problems, and some vision difficulties. But the most dangerous part is that her body may "forget" to breath. KM's brain does not recognize a lack of oxygen or build up of carbon dioxide until it's too late and she's stopped breathing. KM's nursing care keeps her healthy and out of the hospital. For example, her nurses are able to recognize infections very quickly, and can intervene by altering her ventilator settings and give her medications. She has avoided numerous hospitalizations due to the diligent care she receives from her nurses. 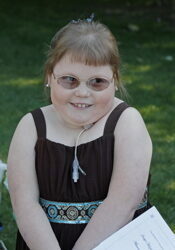 Without the MFTD Waiver, KM would have to live in a hospital, and could not attend school or enjoy her trips to the zoo. 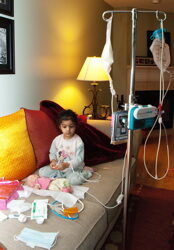 She is just a regular kid who happens to have some extra medical equipment. She needs to live in the community with her family who loves her and helps her to thrive. UPDATE: KM passed away in 2013. 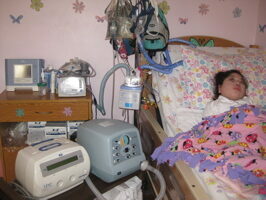 Stephanie lived a happy life attached to a ventilator and in a wheelchair. She died at the age of 19 on May 1, 2010. Stephanie was mainstreamed in school, was on the A honor roll for 4 years in high school, attended events such as dances, sports, and prom, and graduated in 2009. She even won boccia tournaments in Illinois on the state level and then moved on to Nationals. Her dream was to go to college and write children's books. She was well on her way to becoming a productive, independent adult at the time of her death. Her family was lucky in that they held private insurance for almost 16 years and it paid for private duty nursing 24 hours a day. Unfortunately, Stephanie hit the lifetime maximum of her private insurance plan, and once capped out of insurance, she entered the MFTD Waiver. Without the Waiver, one or both of her parents probably would have had to quit their jobs. If both parents had quit their jobs, the entire family would have ended up on public assistance, and that would cost the state even more money. 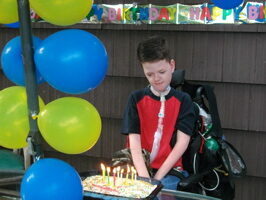 Craig is a very sweet, curious and loving 9-year-old boy who was born with a type of Muscular Dystrophy. He has a tracheostomy and uses a vent for most of the day. He has a G-tube and uses a cough assist machine and nebulized medications to help keep his lungs clear of infection. Prior to being on the MFTD Waiver program, Craig was hospitalized 3-4 times per year. In the eight years since coming home on the MFTD Waiver in 2004, he has only spent 4 days in the hospital. Craig's parents both work and have private insurance, but insurance only pays for 100 hours of nursing per year, which is simply not enough, as Craig needs 24 hours/day nursing level care. 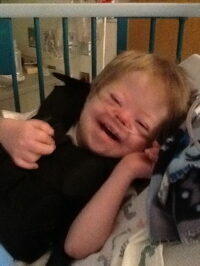 His parents do provide 60+ hours a week of his care but they need nurses to care for Craig when they work and sleep. Even with insurance and the MFTD Waiver, they pay for most of his medications and many other supplies he needs on a daily basis out-of-pocket. Without the MFTD Waiver, one or both of Craig's parents would be forced to quit their jobs and his family would most likely have to depend on state assistance and disability benefits to supplement their income. Alternately, Craig would need to be hospitalized, and would need to be at an ICU level of care, which is very expensive. If hospitalized, all of his expenses would be paid for by Medicaid, which would ultimately cost the state much more money. C is an 8-year-old diagnosed with cerebral palsy, Down syndrome, stroke, hypoxic brain injury, seizures, heart defect, pulmonary hypertension, primary immune disorder, severe lung damage, and reflux/silent aspiration. He has participated in the MFTD Waiver since 2005. He currently uses a pulse oximeter, suction machine, is on oxygen, has a G tube for nutrition and is continuously fed via feeding pump. He requires nursing-level care at all times. Since his medical needs change--sometimes from hour to hour--his family depends on nurses who can assess the situation and act quickly. C's family is very thankful for the Waiver program. While C's family has a PPO private insurance plan, his family's out-of-pocket expenses per year without the Waiver are more than $200,000. Before participating in the Waiver program, C's parents had no choice but to divorce and live separately so that C would qualify for a medical card as secondary insurance to pick up the extra expenses not covered by primary insurance. While on the Waiver, C's family has been able to keep him at home and relatively well. Without the Waiver, C's father would either have to leave the home again, or C would need to live in an intensive care unit, running the risk of aquiring hospital-borne infections. Because C is so medically complex, it would cost about six times more money to keep him in the hospital than it does to provide him with nursing care at home. BJ is a charming 15-year-old who used the MFTD Waiver for many years. He was born 3 months prematurely with Spina Bifida and an Arnold Chiari Malformation, which compressed his brain stem. After 8 months in the hospital, he went home on a ventilator 24 hours a day, G-tube dependent for nutrition and on numerous medications. He required 24 hour hands-on care because of "blue spells" and apnea episodes when he would stop breathing. He also developed a seizure disorder at 16 months old that required he be monitored constantly. His family used private insurance for nursing as long as possible and then started using the MFTD waiver when insurance would not cover his nursing. He slowly began to wean off the ventilator during the day but needed it at night for many years. Eventually, he slowly weaned off the ventilator at night as well. This was a very slow and complicated process that his family could not have done without the diligent and compassionate care he received from his home care nurses. This past summer, he had his trach stoma closed and no longer needs the MFTD waiver for nursing care. He is still medically involved, but is doing great and could have never gotten to where he is without the nursing care he received from the MFTD waiver. 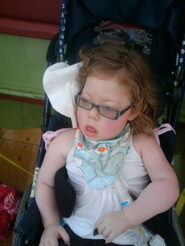 KP is an 8-year-old diagnosed with cerebral palsy and an unnamed progressive disorder. She has participated in the MFTD Waiver since 2006. She currently uses a ventilator, has a central IV line in her chest for nutrition, is on oxygen, has a GJ tube, and has a foley. She requires intensive care level nursing at all times, gets more than 50 doses of medication a day, and requires 6 hours of respiratory treatments each day. KP's family is incredibly thankful for the Waiver program. She has only had one hospitalization in two and a half years, thanks to the Waiver. While KP's family has a PPO private insurance plan, her family's out-of-pocket expenses per year without the Waiver are more than $237,000. Without the Waiver, she would need to live in an intensive care unit. UPDATE: KP passed away in 2014. RD is a beautiful, loving, bright little 4-year old girl who was born with a rare life-threatening gastrointestinal illness. This illness is so rare that it does not yet have a name. It results in severe bleeding from the esophagus, stomach and intestines, persistent vomiting and intestinal failure, just to name a few symptoms. RD has had over 30 hospitalizations to date. She has been on the MFTD Waiver since May of 2011. Since being on the waiver, RD has had only 1 major hospitalization. RD and her family are so grateful for the waiver program as it has allowed them to have some semblance of "normalcy." Without the waiver program, RD would spend much more time in the hospital where she would be exposed to serious infections. Any sort of infection, even the common cold, causes serious complications for RD, which often become life-threatening. D is a 17-month-old with an undiagnosed neuromuscular disorder. He has paralyzed vocal cords, he is not able to swallow and has other neuromuscular issues. 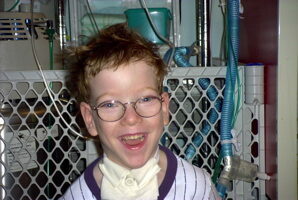 He has a trach, G-tube and uses oxygen when he is sick. He has participated in the MFTD Waiver since 2010 when he came home from the hospital after spending the first 3.5 months of his life in the hospital. We are very thankful for the Waiver program, as it allowed us to bring our son home. D has only been hospitalized once since he came home from the hospital, and we attribute that to the level of care that we are able to provide for him at home, thanks to the Waiver. The Waiver is a much more cost effective way to provide care for D. The cost for the first 3.5 months of his life in the hospital was over $650,000. Because of the waiver, his family is able to keep their jobs and primary PPO insurance. Without the Waiver, D would have to live in a hospital.